Licensed Rambo I First Blood Fixed Blade Knife | BUDK.com - Knives & Swords At The Lowest Prices! Received my knife in the mail a couple days ago. All I have to say is "wow". Such a great knife made with quality. If you are a John Rambo fan, you need this knife. Plain and simple, a great piece for a collector and/or a survivalist. Now ready to buy the First Blood Part 2 knife. Got my Rambo 1 First Blood knife today and looks great very realistic made strong great guilty very great collectors addition.Handle is made of good guilty as well as the blade came in great shape. This knife is extremely well balanced and feels very light, I could wield this thing all day. It has the sharpest point I've seen in a knife this size. The knife fits the sheath very snuggly. I wouldn't like to stitch myself up with the sewing needled though. IN short this is well worth the money (even with the shipping cost). I ordered this knife over night and it arrived on time, but when I took the blade out it was scratched up a little and had some marks on it. Also, I was told by a customer service rep that the blade was made of AUS 8 steel and that it stated this in the certificate of authenticity, but when I received the knife I discovered it did not state that information anywhere. I then had to call back four times through a series of a few weeks to finally find out that it is only 420j2 stainless steel. Kind of a disappointing experience considering it cost over 120$. When it was all said and done. not sure if it's worth it. This is an amazing knife I did the paper test right out of the box...it cut from the base all the way to the tip :)...I was just curious on what kind of steel was used for the blade? This is a nice piece for collection. It is well make and sturdy but doesn't weight too heavily. Mine was not really shape out of the box but can be easily sharpened. 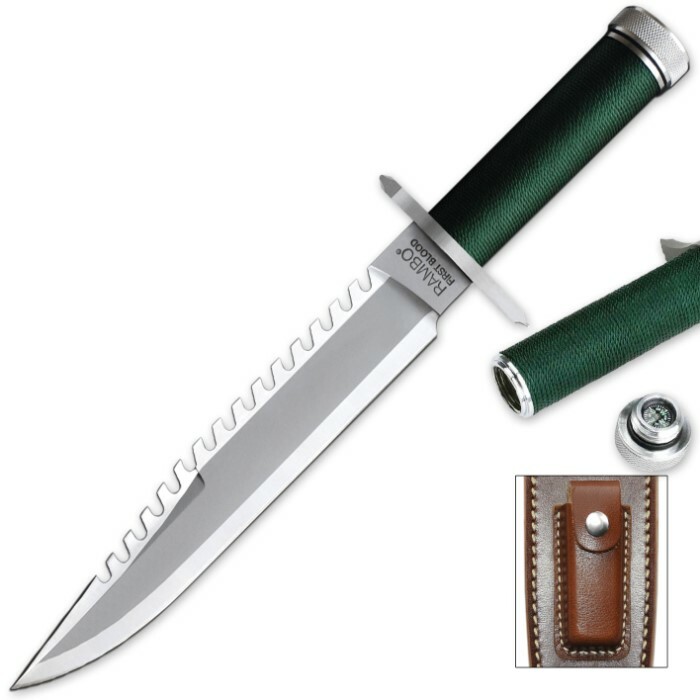 Rambo fans aside, this knife will make good companions for many outdoorsmen. My only complain is that its box has a long slash on one side but it isn't a quality issue on the knife! My son purchased a Rambo First Blood and after using it, I just had to have one for myself. I have purchased my own, and never been sorry. It is a quality knife and a useful tool. I have always used a bayonet or a KA-Bar since I was in the Army, but this knife is a superb weapon for defense and a great camping knife. THIS KNIFE IS GREAT!!!!!!!! I love everything about this knife. The blade comes pretty sharp and the sheath is also great. I haven't used the knife much but I can tell that it can take a beating. This is a great knife to add to any collection and I hope I can add the other Rambo knives to my collection.